I had the chance to work on this new commercial for SkyLinkNet with my friend and guitarist Michael Elsner. 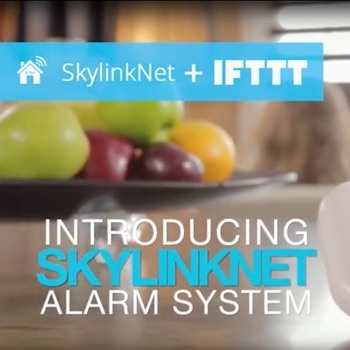 This promo shows how SkyLinkNet’s alarm system can be used seamlessly with the wonderful service IFTTT (If This Then That) to control a smart home. The SkylinkNet Connected Home Alarm/Alert System along with IFTTT recipes allows users to have complete control of their security system and other Smarthome devices using a Smartphone app in conjunction with recipes from IFTTT. The SkylinkNet Alarm System is a self-monitored, self-controlled home security system with no monthly fees or contracts. You can check all sensors status and arm/disarm the alarm system with the SkylinkNet App or from a Smartwatch recipe. The Nest recipe knows to set the temperature to away status once the alarm is armed away. If a sensor is triggered, the internet hub will send the user a push notification through the app. The system comes equipped with a camera that allows the user to view any activity inside or outside the home. In the event that a sensor set off the alarm will send immediate notification and trigger the Philips HUE will light up red. In addition, the Internet Hub features a backup battery. In case of a power failure, all units and sensors would continue to work as a local alarm with an external siren. An emergency dialer will then connect through a phone line to notify the user of the triggered alarm. Geofencing recipes can now open your garage door when you approach your home. You can add various HomeControl Receivers such as the Plug-In Dimmer , Motion sensors and Wall Switch Receivers to control your lighting and small appliances from anywhere with the Wemo recipe. Even if you don’t have your Smartphone handy, you can talk to Alexa, it will turn lights with voice commands. Create Schedule or event trigger to automate your home. The system is designed to be expandable, mobile, and DIY, with no ongoing fees and no wiring necessary.